Making paper flower appeared in Hue over 400 years ago. Over the centuries, Thanh Tien Paper Flower Village continues to preserve spiritual beauty on the altar of all Hue families and become one of the important parts of Hue – the former capital of Vietnam. Do you admire about Thanh Tien paper flower village? Each occasion of worship, besides buy a lot of fresh flowers, Hue people do not forget to buy some paper flowers from Thanh Tien paper flower village to offer to the Gods, ancestors,… These bright colors that simple but have the beautiful unique for spiritual flavor, also add unique features of Hue culture. In order to make the flowers, artisans have to prepare every stages from the months before the rainy season in Hue. They choose the good bamboo in local forest, cut in small, thin and then dry under the strong sunshine. The secret to paper flowers is concentrated in staining, so that the paper retains color durability. Industrial color can not be used here, they just use resins and leaves to make dye in a traditional way. There many kind of flowers can be found in Thanh Tien paper flower such as orchids, lilies, roses, daisies, … which serve only worship and ritual needs and only made in the Lunar New Year, Thanh Tien village also made lotus paper. Thanh Tien paper flower village is rich in color and beautiful form. It is the same characteristics that the formal production time of this craft only occurs at the end of the year, mainly in December, serving the people during the Lunar New Year. Nowadays, tourists can join in making paper flower with artisans anytime here, that really unfogettable moment. 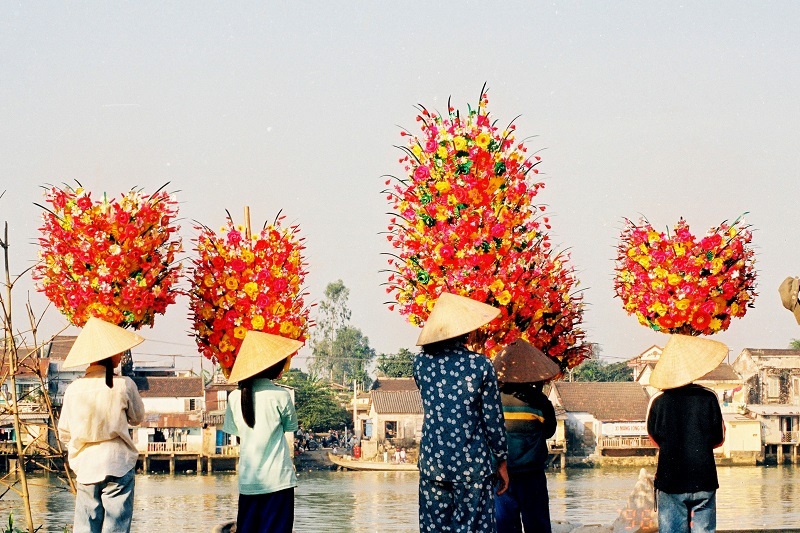 Today, visitors to Hue on the occasion of traditional village festival was held in the city every 2 years. In particular, Thanh Tien paper flower village is an attractive tourist destination for tourists to explore the cultural life of a peaceful old village. Choose comfortable Hue private car is the best choice for visitors, beside a group of bicycle is also a good way to explore the peaceful village. Thanh Tien paper flower village is the place to honor the traditional craft, where conservation and preservation of cultural values of craft villages. So travel Hue, try once to find paper flower village Thanh Tien to see the flowers and feel the soul of the traditional village of Vietnam.